One of my favorite things to alter is giftbags *okie thinks if she were completely honest she would have to say she likes to alter anything that can be taped and glued*. Linda and I were at Goodwill last year after Christmas and they had a big laundry basket of Christmas giftbags that were either 50¢ for $1 but the kicker was they were like 75% off, at least I think that is what they were. Any rate, I got the majority of them and did allow Linda a few for her own stash. 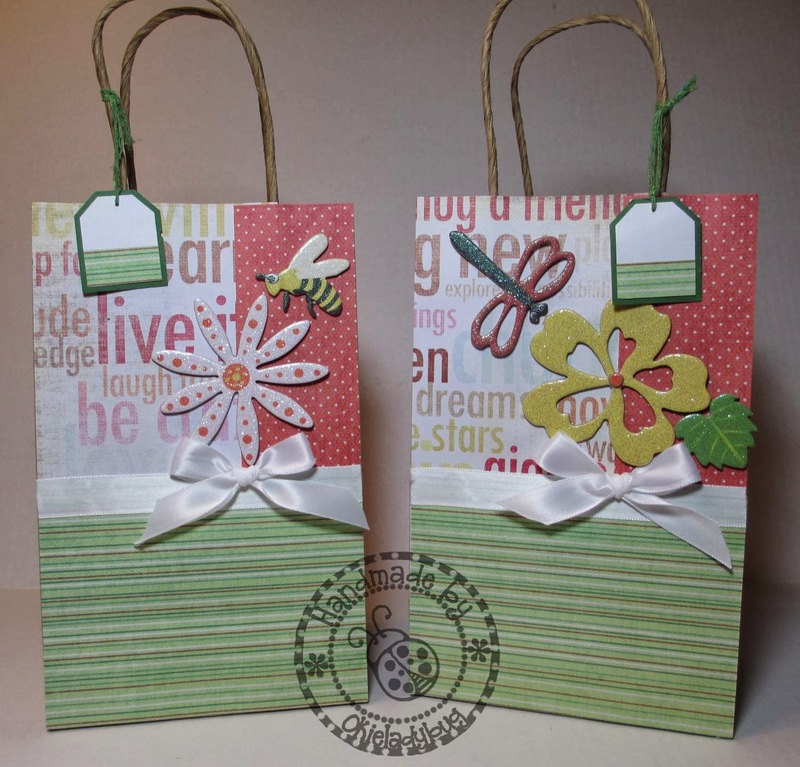 For the next few days I am going to be sharing the giftbags I altered recently. I prefer to use thinner paper for giftbags so they aren't as expensive and usually get the paper pads at either Michaels or Hobby Lobby. To get my paper cut the right sizes I make a template in Make The Cut and figure out how big to cut pieces from there. 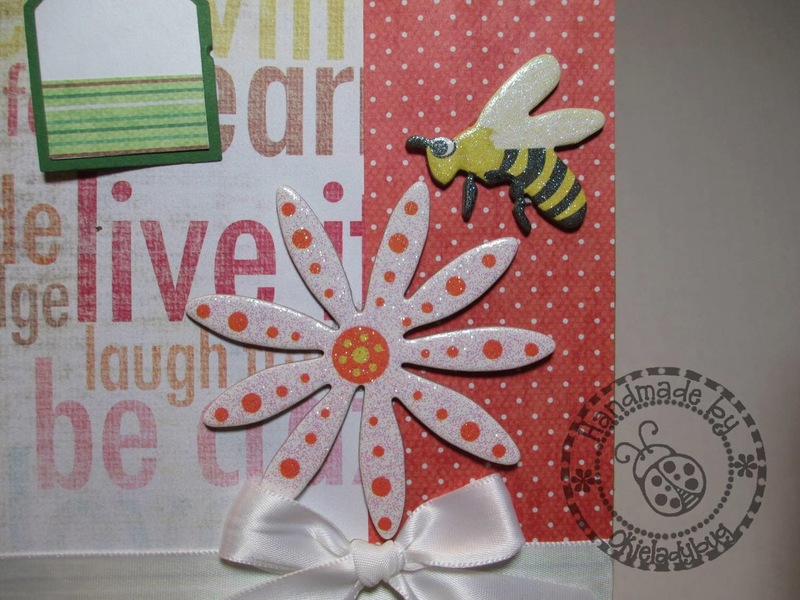 I added a little tag that I made with my Stampin Up Tag Punches and used some twine to attach it to the handle. I found some glitter chipboard pieces in my stash of embellies and thought I would try some of those to add to some bags. I think they worked out great! I did use Terrifically Tacky Tape or Scotch Quick Dry Adhesive to attach them to the bags because I wanted to make sure they would stay put. When you alter your gift bags do you alter the entire bag, meaning front, back and sides? Thanks. It depends on the bag and how much paper I have. These bags had designs on the front and back so I did cover both. Sometimes I don't bother with the back of the bag is plain on the back. How about the sides? Do you paper the side too? How about the sides? Do you paper the sides as well? No I don't usually cover the sides. Sometimes I might put a strip of paper across the top just to tie the front and back together design wise but not very often. I love all your creative work. I love reading your posts as well, you sound like such a friendly and fun person. Thank you for sharing.